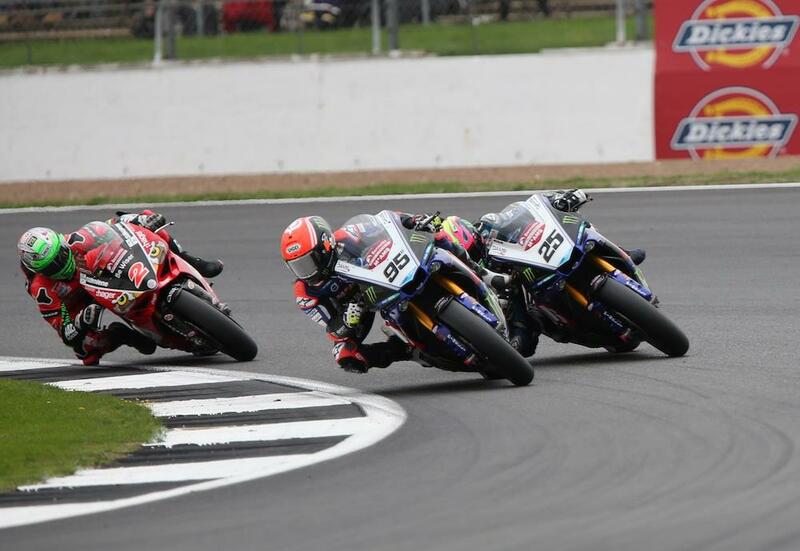 Bennetts British Superbike rookie Tarran Mackenzie stormed to a debut podium in style at Silverstone this afternoon. Taking the lead at the mid-way point, Mackenzie led ten laps of the 30-lap opening race and while Leon Haslam and Glenn Irwin got past to scrap for the win, the young gun held off team-mate Josh Brookes for his first podium of the year. It’s not the first time the McAMS Yamaha rider has shown podium pace – he crashed out of third place on the final lap at Brands Hatch GP back in July but made amends for it this afternoon, holding off a hard attack by Brookes on the final lap to take third by just 0.043 seconds. “I didn’t get the best of starts, dropped back to sixth or seventh and had to come through them all,” Mackenzie said. “Once I got to third and was behind Jake and Brookes I felt really comfortable, so I made some moves and thought if I could lead one lap I’d be happy! The laps kept coming around and nobody was passing me so I just kept my head down. Mackenzie showed he wasn’t afraid to scrap with team-mate Brookes despite the more experienced of the two fighting to confirm his position in the 2018 title fighters’ showdown.